Back in August, Swiss multi-billion asset manager, GAM Holdings - one of Europe's largest alternative money managers - announced it has frozen withdrawals at some of its bond funds after a surge in redemptions from clients who sought to withdraw their money following the suspension of the firm's star manager Tim Haywood, the latest in a series of setbacks that had sent the company’s shares into a tailspin. The troubles started in July, when there was market speculation that a market neutral quant fund GAM had purchased recently, Cantab Capital Partners, was in trouble, and GAM warned of a writedown due to losses at the quant hedge fund. 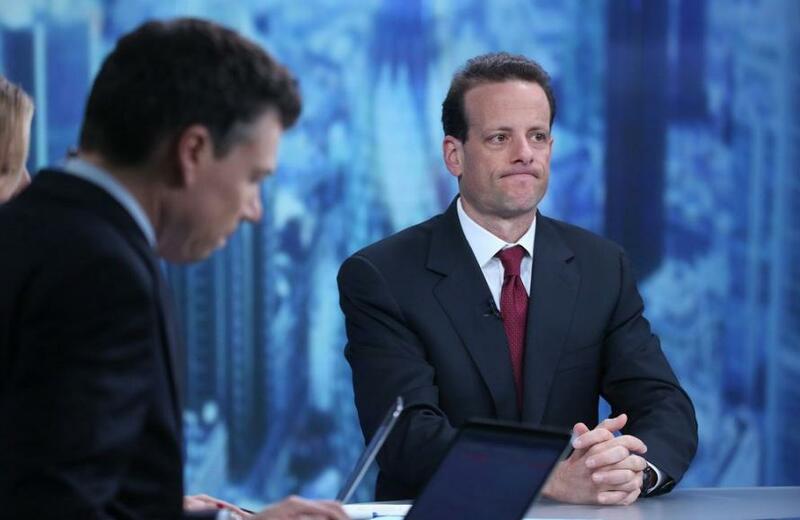 The announcement launched a slide in its shares that only accelerated after the suspension of Haywood, who headed the firm’s second-largest strategy which focused mostly on illiquid investments, and a warning by CEO Alex Friedman that "clients may allocate less money to the firm" because of volatile market conditions. In retrospect, the CEO's caution was just a tad optimistic, because between the partial withdrawal freeze, the fund's ongoing troubles and overall deterioration of the hedge fund industry, on Thursday GAM stock plunged a record 31% when the multi-billion asset manager shocked investors with the forecast of a record loss and news of a mass layoff, while confirming that it was struggling to contain the accelerating outflows prompted by the fund's ongoing troubles. In total, the stock is down a massive 78% YTD. GAM said it would post a record loss of 925 million francs ($931 million) for the year compared with a net profit of 123.2 million francs in 2017, after massive outflows forced it to write down the value of its business. 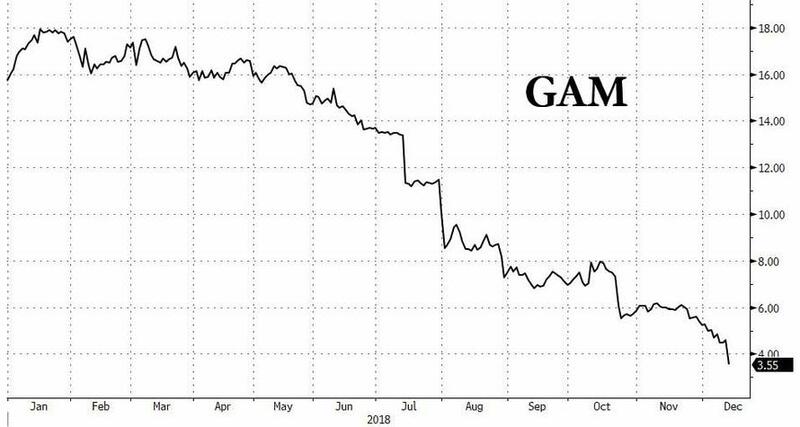 As Bloomberg notes, the loss erases eight years of earnings since GAM went public, and is mainly related to a series of goodwill charges at the group and its Cantab quant funds. Additionally, as it suddenly scrambles to ensure its survival amid dwindling assets and lower fees, the group announced the layoff of 10% of its workers. While interim CEO David Jacob has been seeking to move beyond the tumult created by the suspension of bond manager Haywood in July and reverse the downward spiral of bad news and client outflows, he has found this next to impossible. Meanwhile, GAM reportedly held informal talks with potential buyers with a view to stabilizing the business, although none emerged and the CEO is now focused on cleaning house. Furthermore, with its stock having lost much of its value in 2018, GAM also said it will probably suspend its dividend for 2018 to help rebuild capital. And so, following the suspension of star manager Haywood in July, the risk of staff departures, the possibility of regulatory fines and the ongoing performance challenges which dissuaded any potential buyers, GAM was hit with what Bloomberg called "a perfect storm" of the two worst things that could happen to a hedge fund: even greater losses and soaring client redemptions. A main culprit for the latest disappointing performance was hidden in the list of unexpected writedowns in the form of a $62 million charge for a volatile quant hedge fund unit that GAM acquired just two years ago. Cantab Capital Partners, a quant fund which was purchased in 2016, plunged 29% this year through November, wiping out all of last year’s gains, according to investor letters seen by Bloomberg. Another fund is down about 15% in the same time frame. While Cantab's writedown is small compared to the loss GAM said it will post for 2018, it is a key business for the firm. Acquired in 2016 as interest in algorithm-driven funds boomed, the unit generated shocking losses as it struggled with market volatility in February and again in recent months. GAM was already forced to take an impairment charge on the unit in the first half according to Bloomberg. Meanwhile, the shock from Haywood's suspension has refused to fade amid the firm's clients, who pulled another 4.2 billion francs in October and November, In total, AUM declined by a further 7 billion francs since the end of September when accounting for market losses and currency movements, which contributed a further 1.6 billion francs of erosion to the investment management division's assets. All told, the company expects its performance to deliver just 3 million francs of fees this year, down from 44.1 million francs last year. No wonder its clients continue to head for the exit. As Bloomberg notes, "losing almost 10% of your assets under management in the space of eight weeks isn't a good look in an industry where scale is increasingly important." And while that shrinkage makes a cost-cutting program inevitable - it is safe to say that the 10% layoffs just announced is only the beginning - there's only so much interim CEO David Jacob can trim without harming the firm's recovery prospects. "It’s very difficult to predict flows," the dejected CEO admitted. 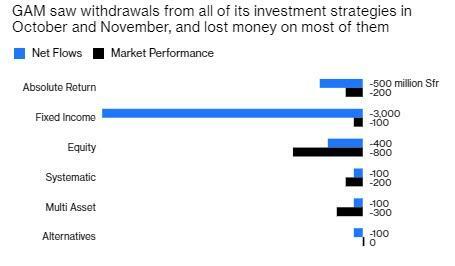 "October and November were particularly bad months for the industry in general, with added difficulty for European asset managers." 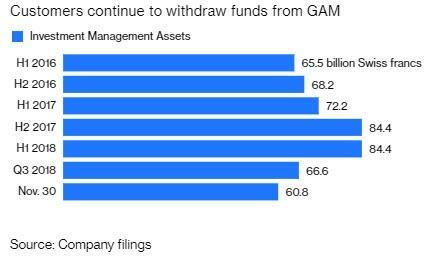 Overall, GAM's assets declined by about $18 billion in the third quarter as Haywood’s funds were liquidated and clients pulled money from other strategies. Additional redemptions came as a result of volatile returns and an investor flight to low-fee products which have squeezed profits both at GAM and elsewhere, forcing many money managers to consolidate. As Bloomberg concludes, looking at the overnight news that another hedge fund, Geneva-based Philippe Jabre, decided to shut up shop (after his flagship "global balanced fund" plunged more than 40% year-to-date), life isn't getting any easier for the active fund management crowd. Meanwhile, in the absence of either easier-to-trade markets or a brave suitor, it's hard to see what can reverse GAM's decline. Unless of course, the computerized model belongs to GAM where it was responsible for a crushing, perhaps terminal, loss.